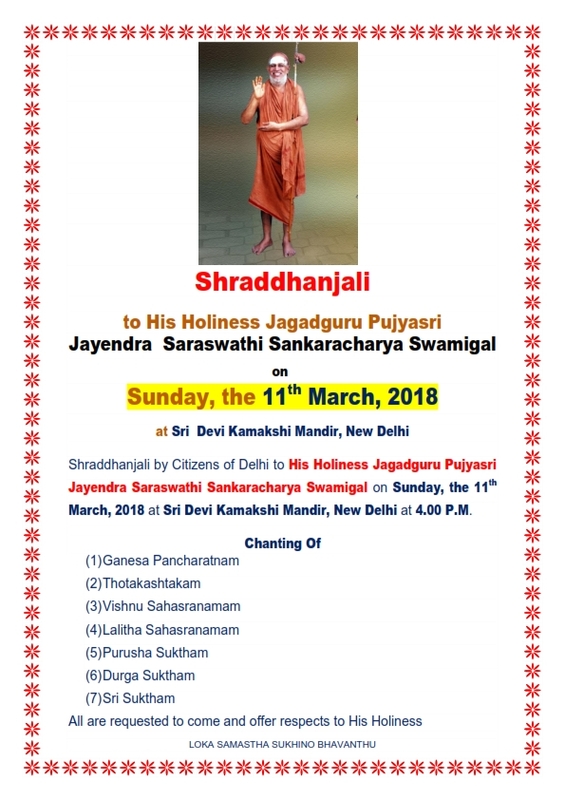 Adya Sankar Mandir, Sarasbaug will conduct Chatur Veda Parayanam on the eve of first Aradhana of HH Jagadguru Pujyashri Jayendra Saraswathi Shankaracharya Swamigal. Programme - from 8 March to 13 March 2018 - Chaturveda Parayanam from 9 am to 12.30 pm followed by Prasad. 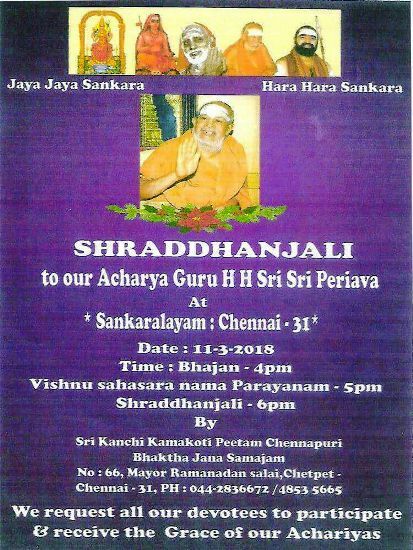 Jaya Jaya Shankara Hara Hara Shankara !! As we all know, His Holiness Kanchi PujyaShri Jayendra Saraswathi Swamiji attained Siddhi on February 28th at Shri Matam. 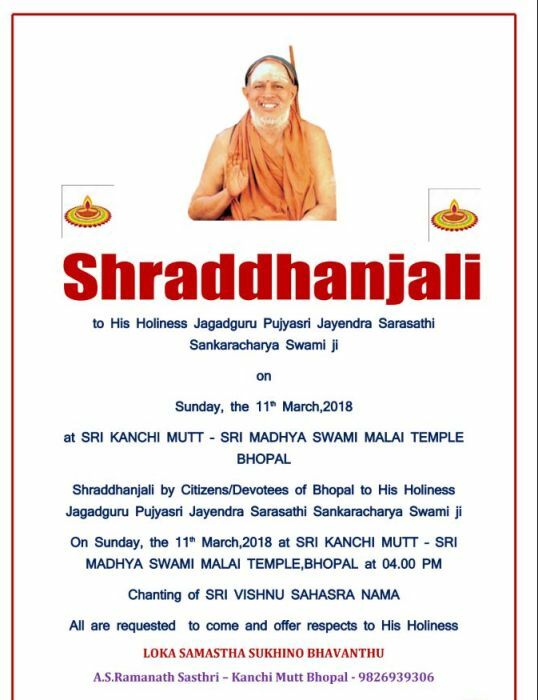 This week coincides with ongoing Shraddanjali for His Holiness following His MahaSamadhi, with Aradhana on March 13th at Shri Matam. 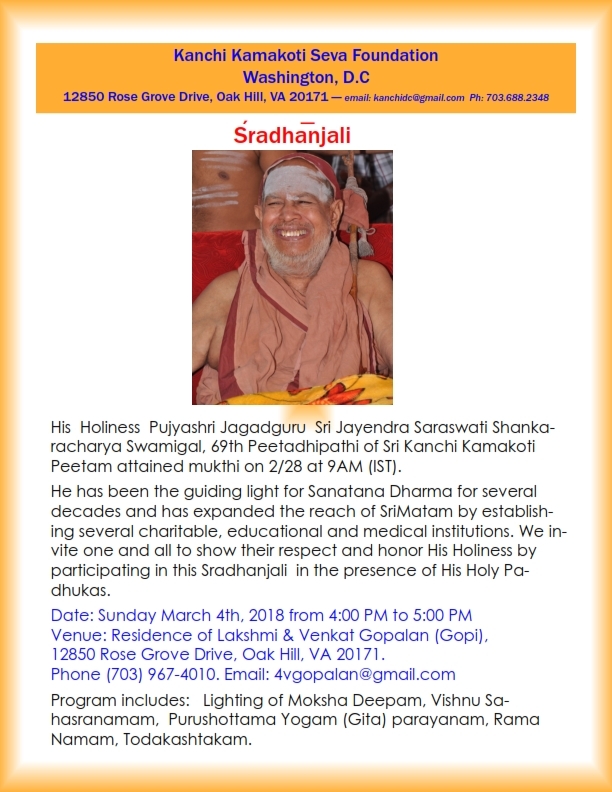 KKSF is planning a Shraddanjali function for His Holiness on Saturday March 17th, 830 AM, with MahaMangala Harathi by 1230 PM, at Shri Ganesha Gayathri Temple, 16059 151st Street, Lockport, IL 60491. 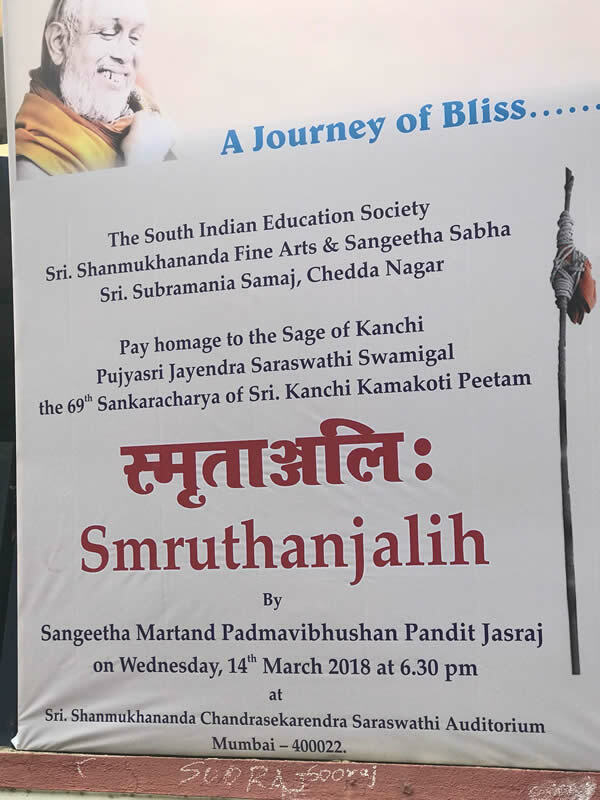 The program will be led by Shivashri Chandrasekhara Gurukkalji and will include Guru Vandanam, Shri MahaGanapathy Puja, Rudrabhishekam  followed by recitation of Shri Vishnu Sahasranama, Purushottama Yoga adhyaya of Shri Bhagavat Geetha (Chapter 15), Bhajans, Archana and MahaMangalaHarathi. Children are encouraged to join and chant bhajans. We hope you are able to join us and receive Shri Acharyas' Blessings. We will appreciate if you can confirm your participation (Yes/No/Maybe) by Thursday March 15th, to help with planning, by RSVP to kksfmidwestrsvp@gmail.com. 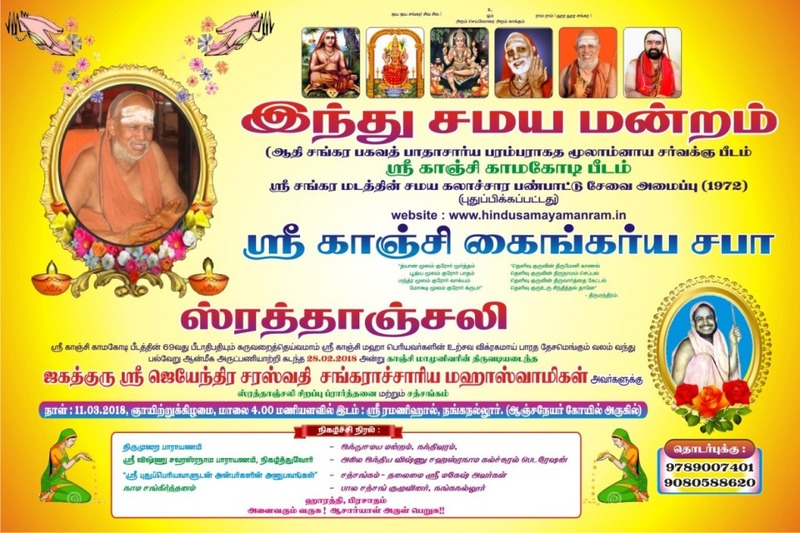 Please remember to download and bring your copy of Shri Matam Swasthi Vachanam, Shri MahaSwami Ashtothram, Maithreem Bhajatha, etc., from http://www.maharudram.net/downloads. You may also download your copy of Shri Bhagavat Geetha Chapter 15 (Tamil, Telugu, Kannada, Malayalam, Sanskrit) from this Downloads section on our website. 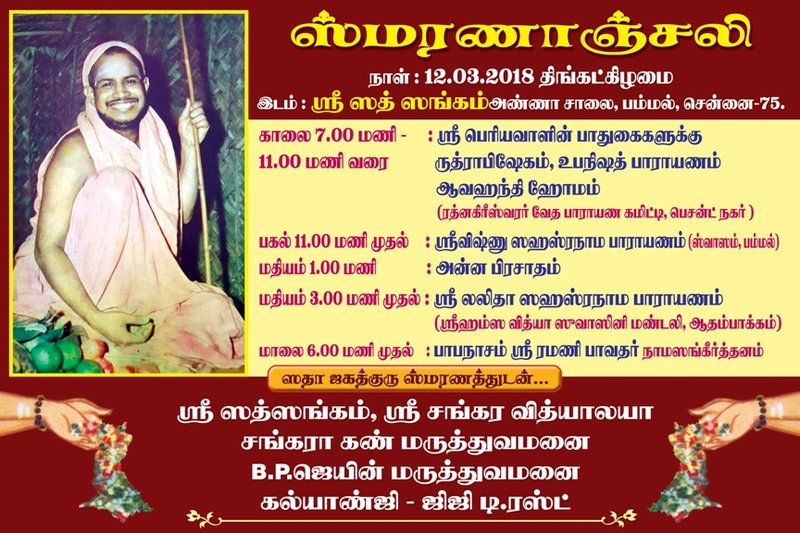 Please note that Kanchi Acharya PujyaShri Vijayendra Saraswathi Swamiji's 50th Jayanthi falls on Monday March 12th. With the Blessings of our Shri Acharyas, KKSF plans to conduct Jayanthi celebrations during the month of April. A separate announcement will follow.